FaaS. Flight as a service. Like many of my fellow SAP Walldorfites, I spend too much time in Terminal 1 at Frankfurt Airport. I used to think that queuing was something done in communist countries to get bread, but now I realize that queuing is what we in the western world now do to earn our bread. I fly with Lufthansa a lot, and I’m a fan. They are mainly on time, and I collect the rock hard bread rolls one gets in economy class and I’m using them to build an ecofriendly house. Lufthansa works for me because they have more direct flights from Frankfurt than anyone else. I also get to read the FAZ and improve my German. I have a German colleague, who, when he gets on the plane, can tell me what model of Airbus it is, its range and even who made the engines and their thrust. I try to avoid sitting next to him. Most of us want to get from A to B as quickly and safely as possible. If the lounge is nice, that’s a bonus. Software is pretty much the same most people just want to get something done for them. If software can do it quicker or better, great. As vendors, we are often a bit like my colleague in 13D. We talk about details that bore normal people. Designing, building and delivering an aeroplane is damn difficult. Ask Airbus at the moment. You need lots of clever aeronautical engineers (what a cool job that must be), Experts in composite materials and wiring (whoops), and project managers. It is a massive capital and intellectual undertaking to build a machine that can lift people into the air and whiz them around the planet. 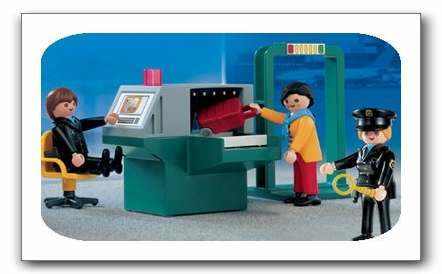 Running an airline, on the other hand, is a service. It is also difficult, but it is a different kind of difficult. You need to focus on punctuality, service and cost. Customers demand the service at the lowest cost. The personnel are focused on serving the customer, at least in theory. It is a service business, run on tight margins. That is why Lufthansa and Ryanair just buy or if they are really clever lease planes, they don’t make them. what has this got to do with BPO and SaaS? I’ve been thinking about BPO and SaaS alot lately. They aren’t exactly the same, but they have a lot in common. Jim from Gartner has provided some definitions in response to the SaaSquisition. The BPO sector has matured a lot over the last couple of years, and we have seen several trends emerge. 1. Standardization is king. BPO providers don’t want to take over messy bespoke processes and run them for you. They are pushing standardization. 2. BPO providers want a single platform to run. Like Ryanair, they want to fly one type of plane. 3. Many BPO providers have realized that they are in the business of selling a service, not building software. Building scalable, standard software to handle complex business processes is not easy. 4. Managing Risk is important. BPO sometimes fails. 5. Winning the deal is the easy bit. I’ve mentioned ADP alot here on Vendorprisey, but I’d like to point you to another BPO provider who is doing well too. Arinso. Business is good for them. They use SAP software to run HR services to a number of major global players, and they have an excellent relationship with SAP. I saw a demo at the SAP UK user group of some cool Ajaxy front end stuff they have done for their on-demand offering, which they call EuHReka- thanks Alex and Liz. Arinso has a new GM in Australia, a long lost friend, Caroline Duvoisin, she is ex-SAP and ADP. I’m often asked why SAP doesn’t offer “BPO”, it is the same reason why Airbus don’t run airlines. ADP, Arinso, Convergys, ACS and others are thinking the same way. They are in the service business, not the software business. There is some good stuff on SAP and BPO over on the SAP site Check out this webcast with Gianni Giacomelli from SAP, and Stephen Dunn from the Everest group discussing Risk in BPO, and technology’s role. I think I’ll ask Gianni to do a guest post or maybe even a podcast. He knows lots about BPO. This is the model we want to achieve with BPO. We want to provide the software that powers the BPO industry, and we are on the way to succeeding. 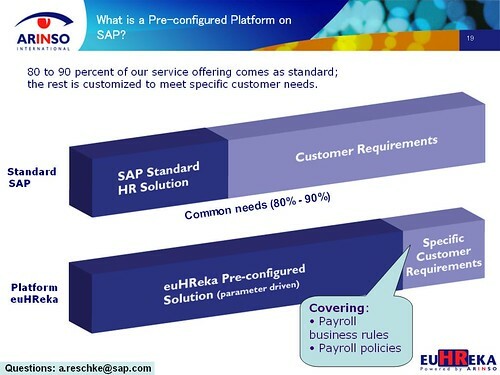 If you are planning to outsource your HR processing, odds are it will be onto an SAP platform. We have been investing in this for the last few years, and it is now starting to pay off handsomely. Vinnie has come up with SACS. The concept is good, but I think this has been happening now for some time. In the comments on a recent post he asked why wasn’t SAP doing more to help the ecosystem. I’d suggest he have a look at what we are doing with folks like Arinso. This is how Arinso read the customer demand, and their response. And these are the delivery options. As you can see the HR outsourcing model has moved on. The configuration is dramatically reduced through template, preconfiguration and serivce catalogues. Recent wins for Arinso include Repsol and Bank of America’s European operations. I’ll see if Rudy can send me a demo and I’ll link to it here. I was going to extend this metaphor to SaaS, but I couldn’t face another visit from the Spanish Inquisition. I’ll pose a question instead. What would happen if big software vendor was to build a fabulous platform, with 1000’s of preconfigured services ranging from HR to CRM, that met all the technical SaaS purity laws (SOA, MT and so on). Then it had several service vendors who really understand running a service profitably run them? Also, see the momentum for GlobalView generally 500,000 employees, over 50 companies. Albert Martens from IKEA spoke at the SAP HR Best Practice meeting that I organised last month, and has a very clear view how he sees standardisation and best practice fit together. IKEA is a fascinating business. I had a peripheral involvement in the deal, and I’ll hopefully be staying close to this one as it is implemented. I will learn lots. ROSELAND, New Jersey — July 24, 2006 — ADP® Employer Services International, a leading worldwide provider of integrated outsourced payroll, benefits and human resource services, today announced it has been selected to provide GlobalView(SM) HR and payroll services for IKEA, the international home furnishing company. ADP will be IKEA’s sole human resource outsourcing provider for its entire worldwide organization, presently representing a total of 90,000 employees across 40 countries in Europe, North America, and Asia Pacific. “With GlobalView, we have one platform for our HR and payroll services and the ability to ensure a world-class HR and payroll service experience for all IKEA employees worldwide,” said Albert Martens, IKEA’s Director of HR Services. IKEA is consistently ranked as one of the best companies to work for, and remains dedicated to ensuring a quality experience for its employees whether they are based in Sweden or Singapore. Delivered on a single-source platform, GlobalView combines the expertise of local HR and payroll professionals with knowledgeable, multilingual, multicurrency services and compliance from regional service centers located around the globe. “We’re pleased to help IKEA uphold its commitment to delivering quality services to its employees worldwide,” said George Stoeckert, President of the Employer Services International Division of Automatic Data Processing, Inc. “IKEA’s selection of ADP underscores the momentum of our partnership with SAP. 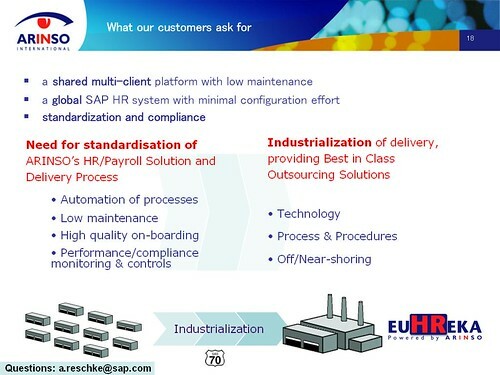 It also demonstrates the confidence companies are placing in GlobalView as the global HR outsourcing service of choice for multinational corporations that want to ensure consistent service and regulatory compliance worldwide.” GlobalView leverages the SAP solution for Human Capital Management (HCM) mySAP(TM) powered by SAP Netweaver® to deliver this leading single-source, multilingual, multicurrency human resource outsourcing service. ADP Employer Services International, part of ADP Employer Services, offers GlobalView in more than 30 countries worldwide, expanding to 50 countries by 2008. More than 50 multinational companies representing more than 460,000 employees globally have selected GlobalView for human resource outsourcing service worldwide. For more information about GlobalView, please visit http://www.globalview.adp.com/. Automatic Data Processing, Inc. (NYSE: ADP), with over $8.0 billion in revenues and more than 600,000 clients worldwide, is one of the largest providers of a broad range of premier, mission-critical, cost-effective transaction processing and information-based business solutions. ADP® Employer Services (ES), a division of ADP, offers the widest range of HR, payroll, and benefit administration solutions from a single source, to meet the extensive business needs of employers worldwide. Built with more than 50-years of industry experience, ADP ES’ cost-effective, easy-to-use solutions provide superior value to companies of all sizes. Approximately 540,000 companies rely on ADP ES for unparalleled service and compliance expertise, allowing them to focus on other core activities. For more information about ADP ES or to contact a local ADP sales office, reach us at 1.800.225.5237 or visit the company’s Web site at http://www.adp.com/. Since its 1943 founding in Sweden, IKEA has offered a wide range of home furnishings and accessories of good design and function, at low prices so the majority of the people can afford them. IKEA has been ranked in FORTUNE’s annual “100 Best Companies to Work For” List (two years in a row), Working Mother magazine’s annual list of “100 Best Companies for Working Mothers” (three years in a row) and Training magazine’s annual “Top 100” ranking of companies that excel at human capital development (four years in a row). IKEA incorporates environmentally friendly and socially responsible efforts into day-to-day business, and continuously supports initiatives that benefit causes such as children and the environment. To visit the IKEA Web site or for information about working at IKEA, please go to http://www.ikea-usa.com/. HP move into HR BPO with the Nestle deal. Nestle recently appointed a new CFO, and I think this is driving some of this activity. He is ex-Procter and Gamble, and they have an excellent track record in managing BPO partners. The HR deal is on the back of a deal with HP for parts of the finance processing. I would expect HP to acquire an SAP HR consulting practice sometime soon, as SAP is the dominant packaged application platform for HR BPO. Accenture recently bought Pecaso, so who is next? It will be interesting to compare Unilever and Nestle over the next couple of years. Nestle have an SAP HR platform which drives most HR transaction processes, but Unilever have a more fragmented set with a mix of PeopleSoft, SAP payroll outside of the US and bits and pieces of other things too. Author Thomas OtterPosted on July 19, 2006 July 19, 2006 Categories BPO, HR Technology, SAP6 Comments on HP move into HR BPO with the Nestle deal. BPO is receiving lots of coverage at the moment, especially given the Accenture Unilever deal. Big deals continue to be closed, but the challenge remains; how make it profitable and scalable.Long term BPO success is dependent to being able to provide a process more cheaply and more effectively than a single "in house" operation could do. If BPO cant do this, then they is little point in doing it. It will be interesting to compare the Accenture Unilever story with that of the Procter and Gamble IBM story. Procter and Gamble had moved all core HR and Payroll processing onto a single SAP HR instance (all 90 odd thousand people and all 90 odd countries) Unilever, I believe, on the other hand, has a big mix of local and global systems, some Peoplesoft, some SAP. AT SAP, we believe that standardization and making use of technology effectively are key to achieving profitablity for BPO providers, and ultimately for the long term success of the concept. If you are looking at BPO as a customer, then this may help you figure out some of the questions you may want to ask your provider. June 28, 2006, 10am EDT / 4pm CESTJoin SAP and Morgan Chambers for this free online seminar ´Hosted by SAP and outsourcing advisors Morgan Chambers, this webinar will address why sustainability is important in today’s BPO marketplace, the benefits of standardisation and the leverage of technology in order to successfully achieve this goal.Wednesday, June 28, 2006. Recently, the BPO marketplace has seen a shift change towards a focus on creating sustainable Outsourcing relationships. Although there is still a recognition that short term cost savings will be a factor in any BPO transaction, executives are now looking to achieve more long term benefits from their Outsourcing contracts. 5. Which aspects need to be considered when choosing and implementing the underlying technology solution for BPO. A case study will illustrate how one organisation has utilised standardisation, both on a process and technology level, as key to transformation and the achievement of long term sustainable benefits. Attendees will have the opportunity to post questions to the speakers for discussion at the end of the event. Registration for this event is free. To register, please click here. For further information, please contact Helena Mancini at Morgan Chambers or Sebastian Burgarth at SAP. I've watched a bit of the US sapphire via SAP TV. you can do the same if you register at sap.com. So far, the most interesting bit was the ADP cameo in Leo's keynote. check it out. ADP's CEO elect, Gary Butler posed the question "why are SAP and ADP working together?" dont they compete in the HR space? Well, the answer is the offering GlobalView. This combines SAP's HCM and CRM solutions with ADP service delivery. good stuff. This isnt just an announcement about future plans to work together. ADP have invested over 50 million dollars setting up the architecture and getting templates etc in order, and will invest another 50 million over the next two years to expand the service to more than 50 countries. The model works for the customer, they pay for a service when it goes live and as they consume it. ADP can focus on service, not trying to build software. It works for SAP, as the customer is on an SAP platform, and we have a new revenue stream. It wasnt easy putting this deal together, and both ADP and SAP had to change a lot of internal doubters to drive it through. Our BPO team have done a great job in aligning the goto market and our sales organisation too (there is even a BPO safe passage option). The guy who ran the SAP EMEA HR business, Phillip Booth, is driving the relationship from the SAP side. ADP are really scaling up on this too. Does this shake up the BPO space. You bet. Hewitt is the odd one out still clinging to the venerable Cyborg. ACS, Convergys, Arinso are all in the SAP boat. I think this shows a lot of HR thought leadership from SAP.